What is veterinary chiropractic? Chiropractic care is a manual therapy that focuses on the biomechanical and/or neurological dysfunction of the spine and extremities. The dysfunction affects the nervous system including balance, proprioception, muscle and nerve function. A chiropractic adjustment is defined as a specific, high velocity, low amplitude controlled thrust which helps return normal joint motion. This therapy helps the body heal innately. Since motion is 90% of the input into the nervous system, joint motion is critical to body mechanics and organ function. The Nervous System. The spinal column is a complex network of vertebra, ligaments, muscles and nerves. This column supports and protects the spinal cord and nerves. Nerves exit the spinal cord at the location of the movable joints between the vertebra. The motion of the joints helps with the function and integrity of the nerve. When a subluxation or vertebral subluxation complex (VSC) occurs, nerve function is diminished at one or more joints. Some people say that the bones of the joint are “stuck” or refer to the term “pinched”. What causes a Vetebral subluxation complex (VSC)? Who can benefit from chiropractic care? Musculoskeletal issues, tense or stiff patients, prophylactic to maintain fitness and soundness, enhance performance in sport horses, complementary treatment for chronic lameness. Chiropractic care requires that the patient be examined prior to the adjustment. 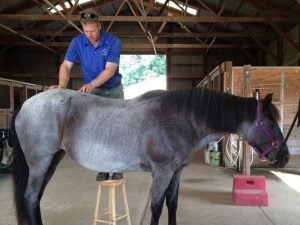 This examination can include posture and gait analysis, spinal and extremity static palpation, spinal and extremity motion palpation, and orthopedic evaluation. Animal chiropractic treatment can be complimented by traditional methods of veterinary medicine for optimum therapy. Certification. Certified Animal Chiropractors are licensed Doctors of Chiropractic and/or Veterinary Medicine who have taken 220 hours of a postgraduate program in animal chiropractic accredited by either the International Veterinary Chiropractic Association or the American Veterinary Chiropractic Association.